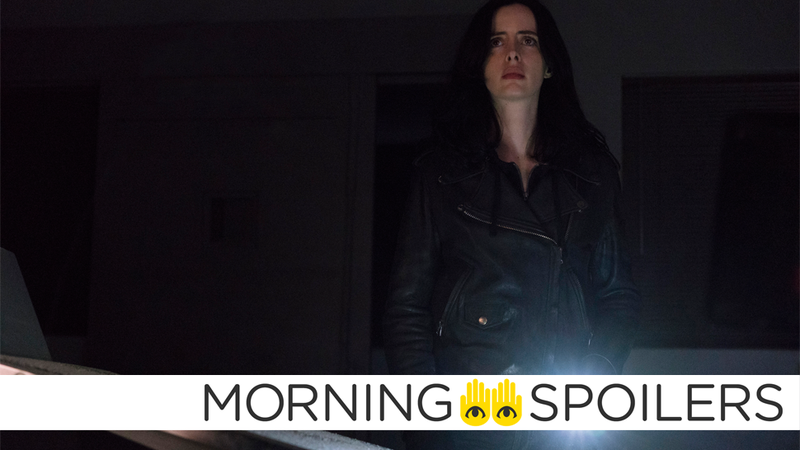 Krysten Ritter is on the hunt for clues as Jessica Jones. Mike Mignola discusses his involvement in the Hellboy reboot. Good Omens continues to have some delightful casting. The could be more to come from the Vampire Diaries universe after the end of The Originals. Plus, new set footage from Shazam and The Boys casts a major character. To me, my spoilers! Brad Dourif lends his iconic laugh to Chucky, the Good Guy Doll in the latest TV Spot for Ready Player One. THR reports Sony has picked up a spec script from Jacob Chase. The story concerns a team of astronauts and oceanographers hoping to follow up their adventures with a trip into the afterlife. Meanwhile, The Tracking Board reports Verve and Industry Entertainment are currently shopping around a spec script for a home invasion movie set during—get this—an alien invasion! Screen Rant has eighteen illustrated character posters in one handy graphic. Shazam directs some beleaguered bus accident victims in a new set video. Speaking with Entertainment Weekly, Hellboy creator Mike Mignola stated he worked on the film’s screenplay but had no hand in production design this time around. It’s funny, because my involvement has been very different than the Del Toro movies. The difference is I had known Del Toro for six years by the time we did the first movie. Neil I met a couple months before he worked on the movie. It was very different, but I have been involved ever since they said ‘Hey we’re gonna make another Hellboy movie, and we’re gonna do this story.’ I’ve bounced back and forth with them about how to adapt this particular Hellboy story. At various times I’ve jumped in and been much more active in the screenplay than I ever was on the Del Toro movies. But I did nothing so far as design stuff on the movie. Guillermo wanted me as a concept artist, but on this movie, there were other concept artists. I came in and I looked at some stuff, but they were trying to do something so close to what’s on the comics that they really leaned on what had been done by Duncan [Fegredo] and me in the comics. Tommy Wiseau plays a cyberpunk bounty hunter in the first teaser trailer for his follow-up to The Room. Right now, we’re writing a series end. Because as far as we know, this could be it. Though details are sparse, Buddy TV reports the CW is considering another series set in The Vampire Diaries universe after The Originals wraps later this year. The new series would star Matt Davis as Alaric and Daniel Rose Russell as the teenage version of Hope. Aria Shanghasemi, Quincy Fouse, Kaylee Bryant and Jenny Boyd would play all-new characters. In conversation with Entertainment Weekly, Janet McTeer discussed the mysterious new character she’ll be playing in season two. It was a very physical character. To play somebody with her kind of issues was something I’d never done before. The way she looks at life is a little skewed. When they sent me scripts of the part, I thought, ‘This is a part I haven’t played before,’. To do something you’ve never done before when you’re my age is really cool. I liked the challenge. These characters are damaged by abuse but are nevertheless struggling their way through life, to try and overcome it and be happy. They’re strong and weak at the same time. Coming Soon has our first look at John Cena’s character, the villainous Baron Draxum. Episode 7.21 is titled, “Homecoming,” according to Adam Horowitz on Twitter.